Held Saturday 21 & Sunday 22 October at the "Swansea Centre"
Held weekend 21st -22nd to the Swansea Centre (below library) CALM`D Coast And Lake Marine Debris School Art Exhibition / Displayed together with Swansea Community Cottage`s "Art by the Lake" Art Show. Results of judging Here are the results of the judging of the artworks by the 3 judges. Congratulations to all those involved the artworks expressed the effects of Marine Debris on the World`s Oceans and Waterways. The Caves Beach - Swansea Area Sustainable Neighbourhood Group (CBSASNG) organised an art competition and exhibition for local schools held 20 - 22 October 2017. The competition invited local schools to participate by producing artworks from marine debris collected from our local parks and foreshores. This initiative seeks to raise awareness of and educate the children about the environmental impact of marine debris while also providing an opportunity for creative expression. ​ for the sponsorship of a prize package for a primary school including a ‘specially tailored’ school visit (educational activity) and a prize pack of resources with a marine focus. * The Office of the NSW State Member for Swansea for their help in this competition/exhibition. *​Woolworths Supermarket Swansea for their help in this competition​/exhibition. for their help in this competition​/exhibition. About Competition and Exhibition. This competition is open to local Primary and High Schools in the Swansea/ Caves Beach area. It is intended to Educate, to Challenge and to Stimulate the imagination of our local school communities to create art works made from Marine Debris items which are found around the parks and foreshores of our local water ways, including the Channel, the beaches, the bays and the Lake. At the same time, create an awareness of the effects this debris can have on our Marine Environment. The Exhibition will be held in Swansea Community Centre from the evening of Friday 20th October 2017 till Sunday 22nd October 2017 in conjunction with The Swansea Centre Art Show. Winning and Highly commended works will be exhibited in the Finite Art Gallery, Caves Beach for 1 week commencing 23rd October 2017. Other selected works to be exhibited in Swansea Library for 1 week from 23rd October 2017. · A story to accompany artwork, from 100 to 200 words, detailing the experience and knowledge gained from learning about Marine Debris and the effects on our Waterways and Oceans. Certificates of Participation will be given to all Entries. · Deliver Artworks to Swansea Community Centre by Thursday 19th October. · Marine Debris items that are used must be clean and Artworks must not contain dangerous items that could cause injury. · Caves beach Swansea Area Sustainable Neighbourhood Group accepts no responsibility for artworks that may be damaged during viewing or for any loss or damage that occurs. * All Entries must be received in the downstairs front hallway at Swansea Community Centre by Thursday 19th October 2017 between 12 and 5pm. Exhibition and judging will be held at Swansea Community Centre from Friday 20th October until Sunday 22nd October 2017. Selected works will then be exhibited for one week at both Caves Beach Finite Art Gallery and Swansea Library. 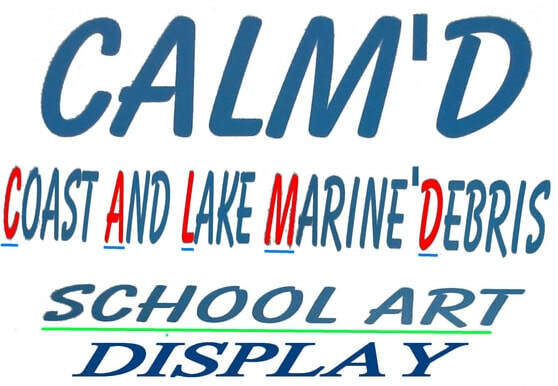 I wish to register an entry for the CALM’D – SCHOOL ART COMPETITION.I agree to abide by the terms and conditions of entry. I declare that the entry is an original work and contains no dangerous components. I give permission for photos of artworks to be used for promotional purposes.